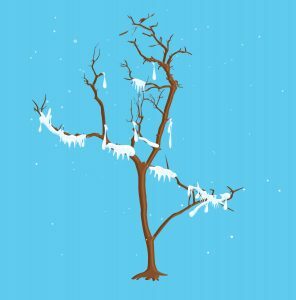 Protecting New Trees from Frost & Animals – Ekana Nursery & Landscaping, Inc.
Winter is hard on new trees and many have died because of harsh conditions the season brings. Even trees planted for a few years can succumb to the many problems winter’s savage temperatures. There are ways to protect trees and keep them healthy until the renewing rains of spring replenish them. One of the most effective methods is wrapping the trees to protect from cracking and animals. Whether the young tree is a deciduous or evergreen, properly wrapping them will keep them healthy for many years to come. There are several ways that the cold temperatures and conditions of winter can impact a young tree. Winter temperatures may be cold, but the sun helps warm up tree bark throughout the day. The heat causes the surface of the tree to stop hibernating and begin to grow. When the sun goes down and the tree gets cold again, it kills the growing tissue. This causes thin bark tissue. Older trees have naturally thicker bark and can handle process, but not young trees. Winter isn’t an easy time for animals. Food is scarce and they start eating anything they can including your new trees. They’ll strip the bark and damage the tree because they’re starving. Their regular food sources are gone until spring, so they grab whatever they can. We talked earlier about how sun scald can create trees with thin bark and animals eat it. When a trees bark is thin and the weather is cold, it can be prone to frost cracking. Frost cracking is when the bitterly cold temperatures mixed with the thin or nonexistent bark create large cracks in the tree. The cracks can be very deep and do tremendous damage to the tree. The warm sun heats up the tree and causes the moisture to expand in the tree. When the sun goes down, the moisture retracts. The outer bark contracts faster than the inner, creating a pressure that leads to the cracking. Tree wrap is a crepe paper-like material found at most nurseries. It is purchased by the roll and can last many years. Start at the bottom with the bottom of the trap in the dirt. Make your way up the trunk, overlapping until you get to the lowest branches. Once done, use twine or tape to secure it to the tree. Don’t start at the top because the overlapping will be upward and moisture can seep into it. If you’re interested in tree wrap or learning how to protect your tree through the winter, feel free to contact us at Ekana Nursery and Landscaping.